Tasty with a mild spice, this gluten free chili recipe is made with beef and beans and is perfect for dinner! And it has a unique ingredient that makes this chili POP with flavor, clove! I have struggled over the years to find a really good chili that I just love and I finally found one!! My sweet friend, Misty, shared her recipe with me and it’s fantastic! For all of you yearning or feeling that fall season coming, this recipe will hit home because it calls for cinnamon and cloves. 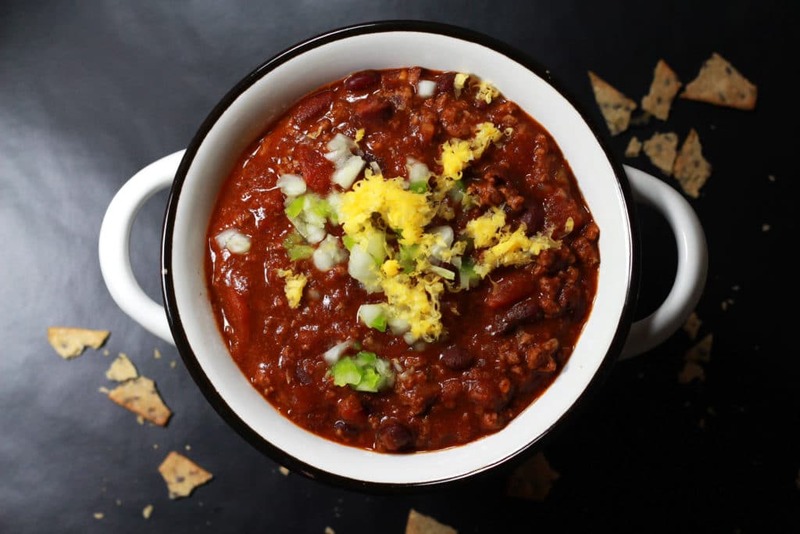 This chili is also perfect for those cold winter months. And it’s a gluten free chili – win win! And ya’ll…let’s talk cinnamon and cloves for a minute. Typically, I wouldn’t think of putting a cinnamon stick and whole cloves in my chili, but this particular recipe is fantastic and has a wonderful taste all because of the cinnamon and cloves! These 2 ingredients make Misty’s Chili recipe so special! This one if Gluten free and full of fiber because it calls for a lot of different types of beans. Also, this recipe calls for 1 Packet of Hidden Valley Ranch Mix. And yes, it’s a Gluten Free product! Read the labels to ensure your brand says Gluten Free! This recipe is super easy to make and my 4 year old son asked for seconds! Now, what 4 year old asks for seconds when eating chili!! That’s how good it is! Oh and he LOVEs this chili on hot dogs! It makes the best chili dogs!! Let’s talk about the cloves for a minute. The cloves in Misty’s chili recipe can be fun for your kiddos! Personally, I don’t like to eat whole cloves. But some people do. A little trick here for you…if you opt to add water to this recipe (you can), the cloves will float to the top so you can easily pick them out when the chili is finished cooking. But I like my chili on the thicker side. If I don’t see the cloves when serving the chili, I tell the kids to look for the “wishes” in the chili. If they find one, they can pick it out and make a wish. It’s a fun way for the kiddos to “play with their food”! I love to eat my chili with noodles or Ono Rice (depending on my mood). I typically put a 1/2 cup of cooked rice or Gluten Free noodles at the bottom of my bowl, pour my chili over it and top it with my favorite shredded cheese. And here’s a cooking tip for you…it’s always best to use a fresh block of cheese! My husband loves to top his off with a little sour cream and sometimes mayonnaise! I know, that’s kinda weird. 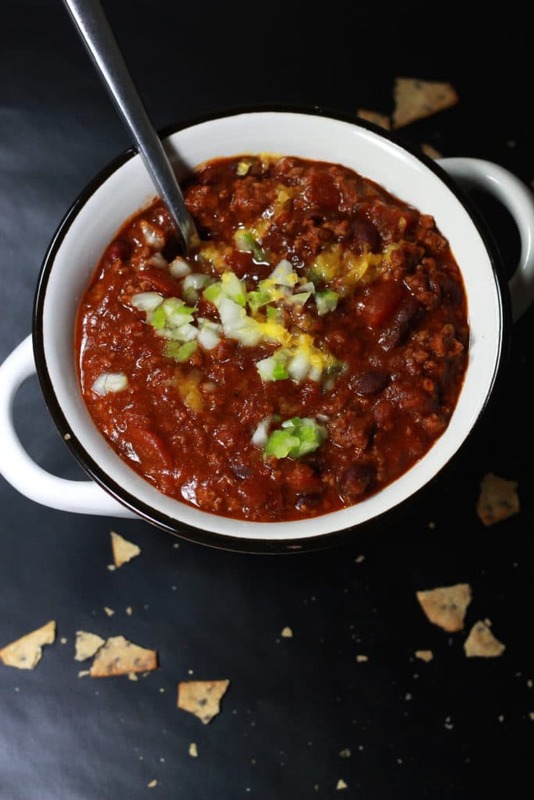 Regardless of whatever toppings you use, you will love this gluten free chili recipe! 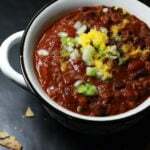 And speaking of gluten free chili recipes, you have to check out some similar recipes here at Recipes Worth Repeating! My Slow-Cooker Southwestern Style Chili is fabulous and if you’re looking for a chili like stew, check out my Southwest Stew! Tasty with a mild spice, this chili recipe is made with beef and beans and is perfect for dinner! And it has a unique ingredient that makes this chili POP with flavor, clove! In a large skillet, brown the hamburger meat with chopped onion and garlic. Drain the fat and then pour into a large pot. Add the can of Fire Roasted Tomatoes with chilies to the pot. Simmer for 5 minutes. Next, add the Worcestershire sauce and chili powder. Mix well to combine. Add chili beans, stir and simmer for another 5 minutes. Rinse other beans and add to chili mixture. Finish by pouring in tomato sauce, adding the cumin and Hidden Valley Ranch Packet. Lastly, add the cinnamon stick and cloves. Simmer for 1 hour on low. You are then ready to serve. This one is also fun to serve over rice and noodles! NOTE: Some people like to remove the cloves once they make the chili. I prefer to look for them in when I serve myself a bowl! Some people like to eat the cloves and some like to toss them Regardless, make a wish when you find the cloves! 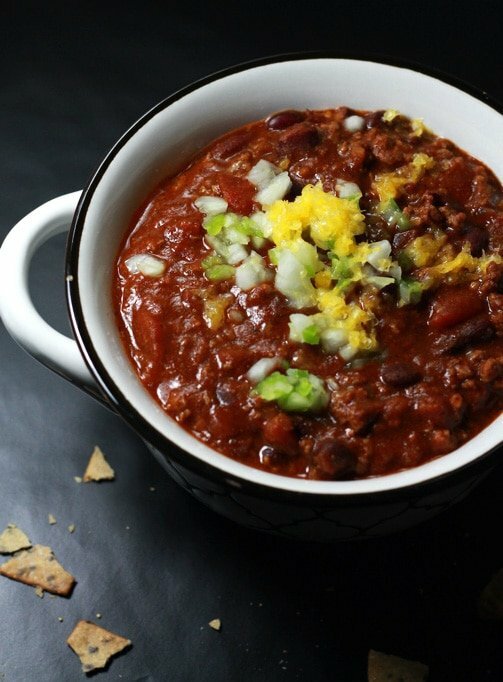 Don’t forget to pin this CHILI recipe to your favorite SOUPS and STEWS board on PINTEREST! I’m loving the addition of a ranch dressing packet to this – I’m going to have to try that! Yes – it’s a great addition!! Provides great flavor!! My husband is a huge chili fan , and looks like my kids are picking it up from him, demanding to try a new chili recipe every now and then. I will make yours tonight, yey! Yeah! Let me know how you like it!! It’s so perfect this time of year!! I’ve always felt like chili is deceptively hard; there are just too many variations and it’s so hard to tell which ones will be worth the work. Can’t wait to give this one a try! I’m the same way – it’s hard for me to find a chili I like! I still like to try different variations but this one is super yum! Chili is the best this time of year! Your chili looks very hearty which I love. Thanks! yes – this one is hearty!! I’ve never thought to put ranch in my chili but I can see how that would be good. I may just have to try it out this weekend. Please thank Misty for me for the idea! I will, thanks! I hope you enjoy!! I think the cinnamon and cloves could add such a nice and warm Winter flavor to the mix. I am going to have to give this one a try! It’s so unique! I hope you love it!